When director Liz Marshall was doing advance promotion for her 2013 film The Ghosts in Our Machine, she called it “a multi-platform endeavor.” That description stuck with me, and so I was not surprised when I read about a new study examining the impact Ghosts has had on the public. This 34-page report says a lot about how animal rights documentaries engage viewers and ultimately change hearts and minds. Part of the study reports on the results of a free screening of the film made available for three days. More than 4,500 people from more than 90 countries watched Ghosts during that 72-hour period, and their responses were evaluated by the Humane Research Council. Prior to seeing the film, viewers’ knowledge was mixed regarding the treatment of animals on farms, in research laboratories, and in zoos and aquariums. Fifty-four percent considered themselves “very” knowledgeable, 44 percent said they were “somewhat” knowledgeable, and 3 percent were “not at all” knowledgeable of the issues. 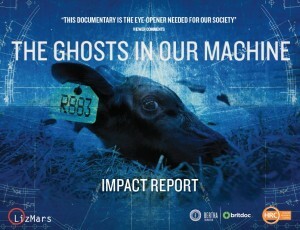 After watching Ghosts, 96 percent said animal rights is an important social justice issue, 85 percent said the film had a “great deal” of influence on them, and 92 percent of viewers said afterward that they believed nonhuman animals are conscious and capable of feeling pleasure, pain, fear, and attachment. 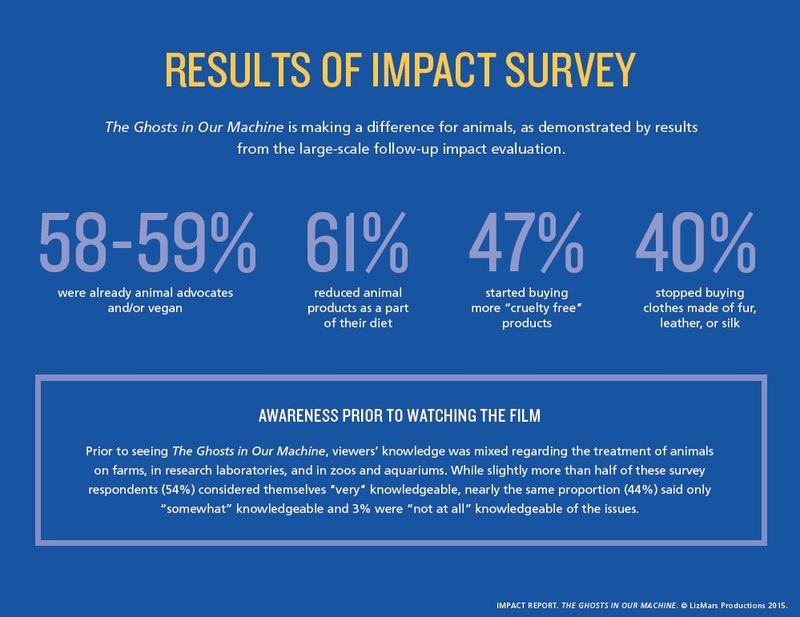 The report charts the film’s success as an outreach model for animal advocacy, but it also demonstrates the ongoing challenge of the animal rights movement: How to get the 75 percent of adults who say the protection of animals is important to change their consumer behavior. After all, if the majority of people believe they have an obligation to protect animals, why do they continue to eat meat, wear leather, and patronize businesses that keep animals in captivity? The report offers some great insights about the impact and engagement of documentary campaigns. With the success of this film—as well as such recent documentaries as Blackfish, Cowspiracy, Forks Over Knives, The Cove, and Maximum Tolerated Dose—it’s clear this medium is a tremendous tool for animal advocacy.